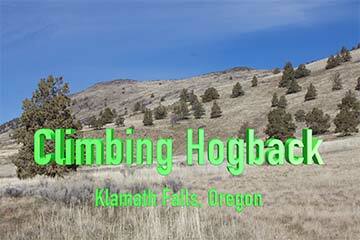 Climbing Hogback - Klamath Falls, Oregon, USA - Explore! 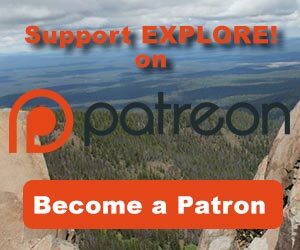 Climbing Hogback - Klamath Falls, Oregon, USA - Explore! When people in Klamath Falls, Oregon want to take a scenic and invigorating hike they don’t have far to go. Hogback Mountain looms over the city’s east side and offers a lot of exercise and some spectacular views over a five-mile trek. 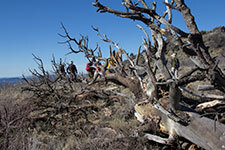 I took this hike with the Klamath Basin Outdoor Group. Hans (Age 70) was our trip leader marking his 2,100th climb up the mountain. While Hans is in better shape than most of us he was a great leader, waiting for the rest of us as needed. The trail starts straight up the mountain and doesn’t level off until nearly the top of the ridge. It then follows the ridge to the summit. The return trip follows an access road on the other side of the mountain. Once in Klamath Falls, it’s easy to find Hogback. Just look for the giant “M” (Mazama High School) on the mountain to the southeast of downtown. 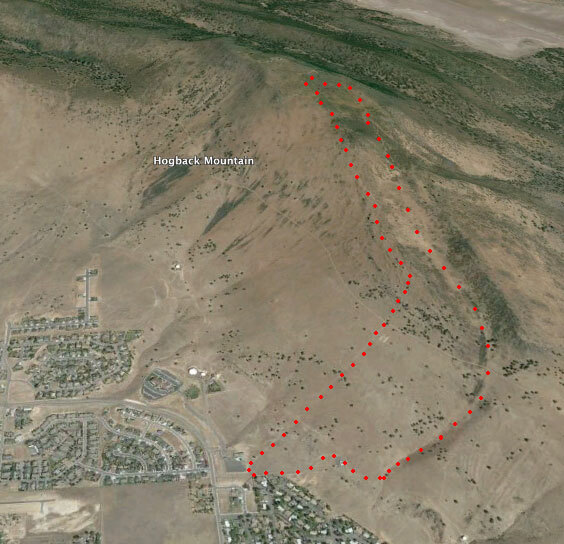 The trail starts behind Foothills Fellowship Church on Patterson Street (42° 13′ 17.93″N 121° 42′ 41.32″ W), right below the “M”, and heads straight up the mountain as can be seen in the above aerial photo. You can get a sense for the steepness of the climb in the video below. You’ll notice a lack of ambient sound because I didn’t think my huffing and puffing would be of particular interest to you. There is a nice resting spot about half way up where a couple of juniper trees offer some shade. Once getting to nearly the top of the ridge, the trail continues uphill, but at a much reduced grade. It follows along the ridge to the summit. Many people return the same way, but we crossed over the ridge and followed an access road and another trail back to the starting point. 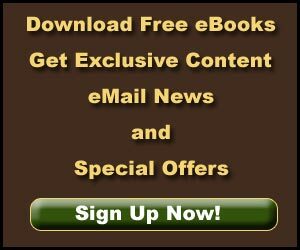 The graphic to the right displays the details. It took us almost 2-½ hours to travel the 5 miles with an 1800 foot climb to get to the top. Hans has done it in 45 minutes, but he’s a special fellow. 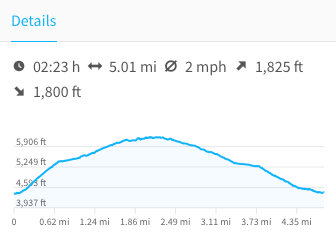 The difference between the uphill and downhill distance is due to my tracking unit, rather than some quirk in the topography. For decades, if not centuries, the Lone Pine was a major landmark along the trail. It fell during a storm, but its remains still offer an opportunity to stop and rest. A fire lookout and several telecommunications towers are located at the very summit (6,194 feet). Those that manage that property would prefer that you stay away for your own safety. 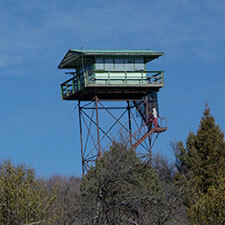 The 30 foot tall lookout tower was moved from Sycan Butte and installed here by the Oregon Department of Forestry (ODF) and the Klamath Forest Protection Association in 1988 after the original tower was condemned. The tower has an ODF low gable cab with a catwalk. The first tower was 41’ tall and built in 1941. The tower is on the National Historic Lookout Register. There is no water available along the trail so be sure to bring plenty. The trail can get really hot on a summer afternoon! So hot, in fact, that experienced hikers like Hans start up the hill at 6:00 am to avoid the heat. Be sure to bring some food for the extra energy you are sure to need and wear good boots as the trail is quite rocky. Also, bring your binoculars to get even more enjoyment from the scenery. While Hans typically climbs the mountain three times a week, even in the winter with snowshoes, we don’t recommend that you try that unless you are very experienced in severe weather conditions. Even Hans tries to avoid rain as there is great potential for hypothermia on this trail. Some people park in the church parking lot at the bottom of the trail, if there is nothing going on at the church. Otherwise you can park on the streets in the area.